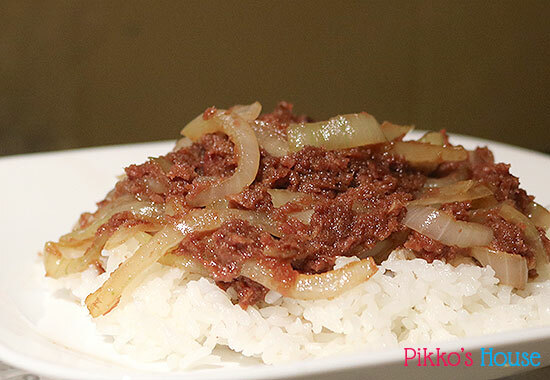 I grew up on a farm in the boonies of the Big Island, and one of the dishes my mom used to make was sato shoyu corned beef and onions, served on hot rice. I loved this dish, and I remember us eating it for lunch all the time. Whenever she’d make it and call us up to the house from working at the farm, I could tell as soon as I walked in the door what it was. Then I married an onion hater, and somehow making an entire dish just for myself seemed like a waste, so I stopped making it. I have no idea how regional this is, but I’m guessing it’s like “egg rice” and common only in certain parts of the Pacific, or even to the Big Island only. Or maybe my mom invented it. I have no idea. Anyway, my daughter has finally decided that maybe she should try that thing Daddy has half-jokingly-but-also-seriously told her for years—that onions are poison. As a result, I finally have another onion eater in the house. Last week was St. Patrick’s Day, and while I bought cabbage to make corned beef and cabbage, I wanted to make corned beef and onions for the two of us, so I bought two cans. And look, don’t judge me. My family hates “real” corned beef, and I should only buy it and cook it if I want to eat an entire corned beef by myself. Trust me, this gets pretty old by the fourth day of leftovers. I hadn’t eaten it in years, but it tasted just as comfort-foody as I remembered, and it was simple enough that I could just wing it after over a decade and it still tasted the same. It’s only four ingredients and rice, so it’s great in a pinch. Update: Before you consider skipping the rice, I do want to note that the sauce is pretty strong, and the rice helps to temper that. I asked my Facebook friends if they’ve ever heard of it or would try it. A lot of them said they would, so if you do try this, please come back and tell me what you thought. Julienne your onion and set aside. Add the corned beef to a skillet on medium-high heat and break apart the meat. I like to pluck out the gross pieces of intestine. Because ew. Cook until nicely separated. Add onions and stir occasionally, lowering the heat after a few minutes. Add the soy sauce and sugar. Let simmer until onions are cooked through.